So I shall give a brief discussion of the Congruence of figures, since the demonstrations are not at all difficult and require little more than a diagram of the figures. Johannes Kepler, Introduction to Book II of Harmonices Mundi. Johannes Kepler, here portrayed with his beloved geometric compass, was the first person to publish a detailed study of the tilings of regular polygons in Book II of Harmonices Mundi ("The Harmony of the World"), published in 1619. The renowned mathematician-astronomer Johannes Kepler published the first classification of edge-to-edge regular polygon tilings in Book II of Harmonices Mundi ("On the congruence of regular figures") in 1619. Google has very conveniently placed a complete English translation of Harmonices Mundi online, so this is the text I will reference on this site. You can read some general background information in this Wikipedia article. Darrah Chavey examined Kepler's tiling results in detail as part of his 1984 PhD thesis Periodic Tilings and Tilings by Regular Polygons. It may seem odd that Kepler, best known for his discovery of the three laws of planetary motion, also delved deeply into such pure mathematics. 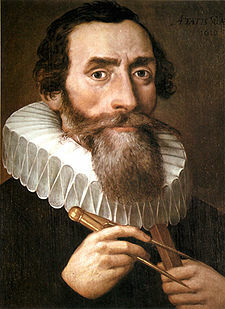 But Kepler was more than an astronomer. Indeed it might be more accurate to call him a mathematical mystic fervently determined to find echoes of his beloved geometry in the detailed planetary data so diligently accumulated by the much more pragmatic Tycho Brahe. Viewed from a modern perspective, Harmonices Mundi is a peculiar mixture of geometry, music theory, science, and astrology. Kepler might have been forgotten as a crank except for the fact that he was a good pure mathematician who was sometimes right about the real world application of his results. His successors extracted the three laws of planetary motion from his mathematical writings and, unfortunately, largely ignored the rest. The laws of physics are indeed derivable from pure mathematics, something that is as surprising today as it was in Kepler's time. Book II of Harmonices Mundi also considers tilings with regular star polygons and tilings of the sphere (leading to polyhedra). Tiling theory contains fascinating unsolved problems that are still being studied by mathematicians to this day. Kepler's results in tiling theory may not, in the end, have been directly relevant to planetary motion. But they were certainly relevant to pure mathematics and were not followed up for hundreds of years. A more thorough analysis of regular polygon tilings was published by mathematicians in the late nineteenth and twentieth century. Kepler's main result was to catalog for the first time the 11 uniform tilings of the plane. In this part of the site I'll be reviewing this result in detail on this site and will comment on Kepler's more general work (and his occasional errors) on regular polygon plane tilings as we go. I won't be looking at star polygons or tilings of the sphere for the time being, but I may add more on those subjects as I expand this website in the future.